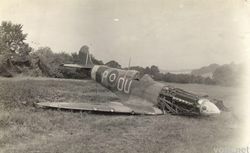 Spitfire JK360 belonging to 485 Squadron (New Zealand) following a forced landing. 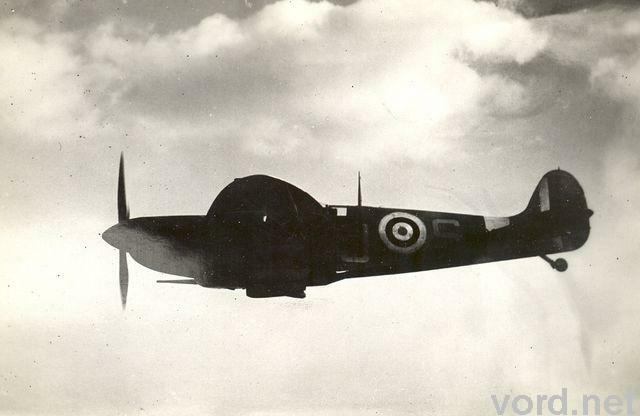 485 Squadron were based at Biggin Hill between July and October 1943 and this photograph was probably taken during that period. 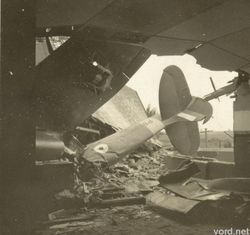 A photograph of the same aeroplane (from a long way away) reveals considerable damage to the port wing. The Spitfire in the photograph is MkVb P8538 which crashed into an airmen's barracks at Biggin Hill on 26th June 1941. 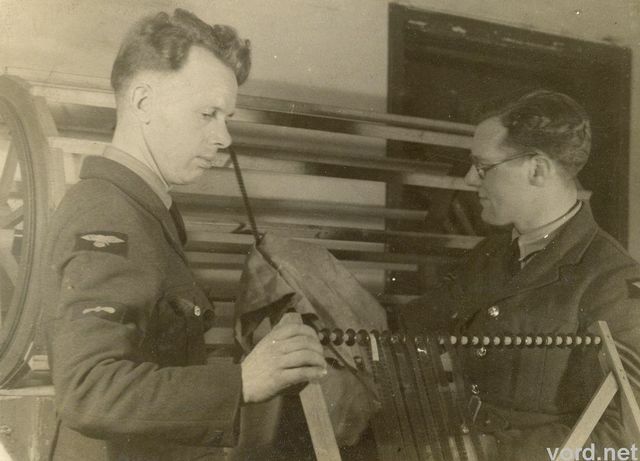 The aeroplane was being delivered from the factory to No.92 (East India) Squadron by No. 1 Ferry Pilots Pool, White Waltham. 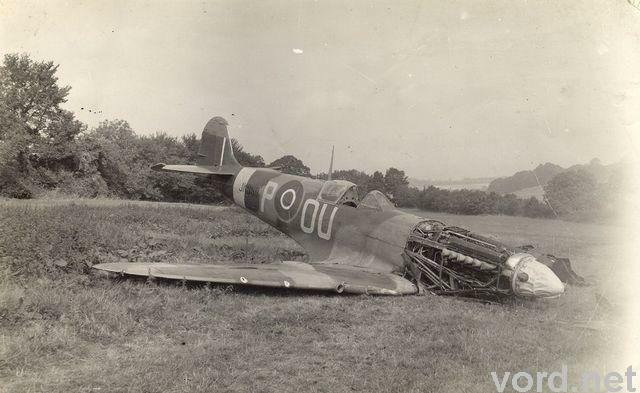 The Spitfire struck the barracks on the downwind approach to Biggin Hill and the pilot, First Officer Willard Noel Estes (an American with the ATA) was killed. The ATA (air transport association) consisted of a group of volunteer pilots that the RAF considered either too old to fly in active service, and pilots whom they considered to be female. Willard Estes was 40 years old at the time of the crash. 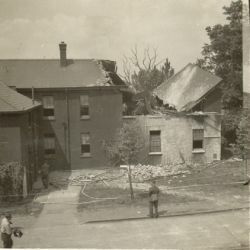 A view of the building shows the damage to the roof. The tail of the Spitfire can just be seen in the photograph. Thanks to David Willaims for providing the background to go with the photograph. 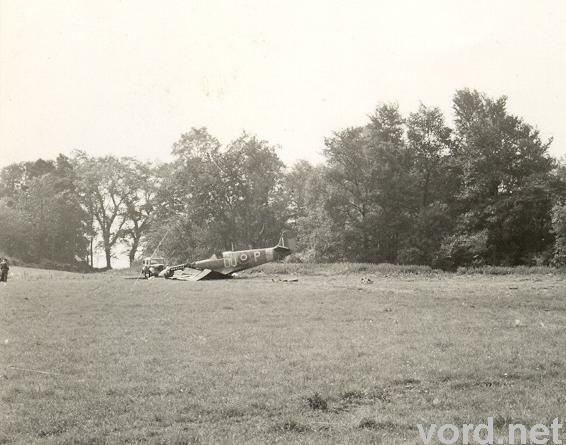 Actually I'm told the Spitfire to the left is a P51 Mustang MK 1 belonging to 400 Auxiliary Squadron (City of Toronto). A photograph was taken each time a fighter aircraft's guns were fired. 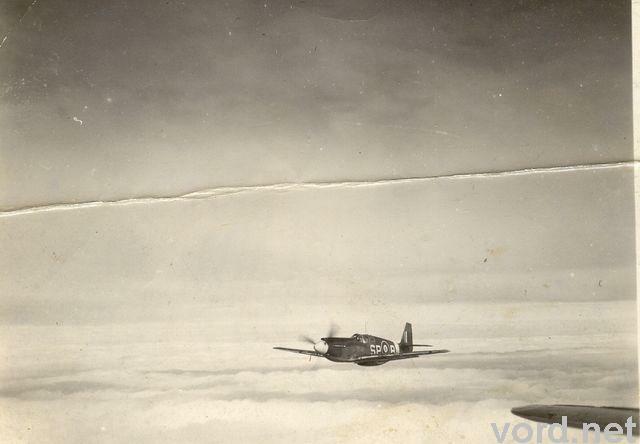 This series of photographs shows an Messerschmitt Me 110 in a Spitfire's gun camera. 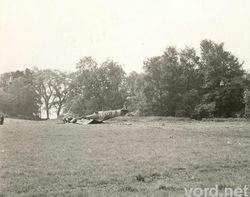 The Messerschmitt banks to the right to try to evade the gunfire. 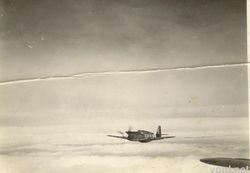 The photographs were used to help analyse the air battle, and to attribute "kills" to the appropriate pilots. Jack Lister (right) and Taffy processing the gun camera films in the photographic lab.